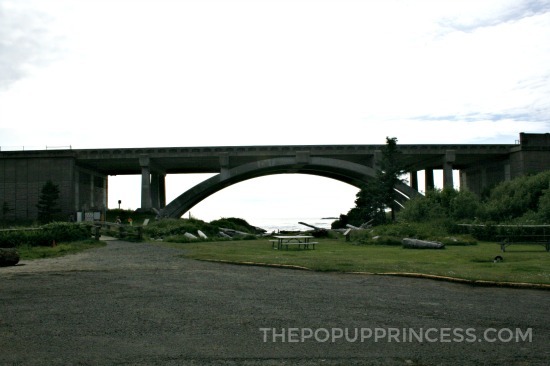 The next stop on our road trip was Newport, Oregon. If you’ve been following along on our summer road trip posts, you know this year we headed back to the Pacific Northwest. This is potentially the last summer road trip for my oldest, as he is off to college this year. We wanted to make the trip epic, and since we had such an amazing time on our last trip up the coast, we decided to head back that way. 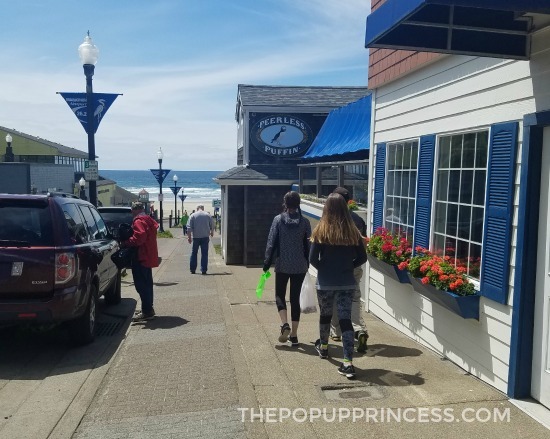 Newport is an awesome vacation spot, and we had so many activities to choose from. We hit Cape Perpetua first, which was about a 35 minute drive from Newport, and it was quite breathtaking. Because we always purchase an America the Beautiful annual parks pass, it was also free. Yay! There was plenty to see, too. 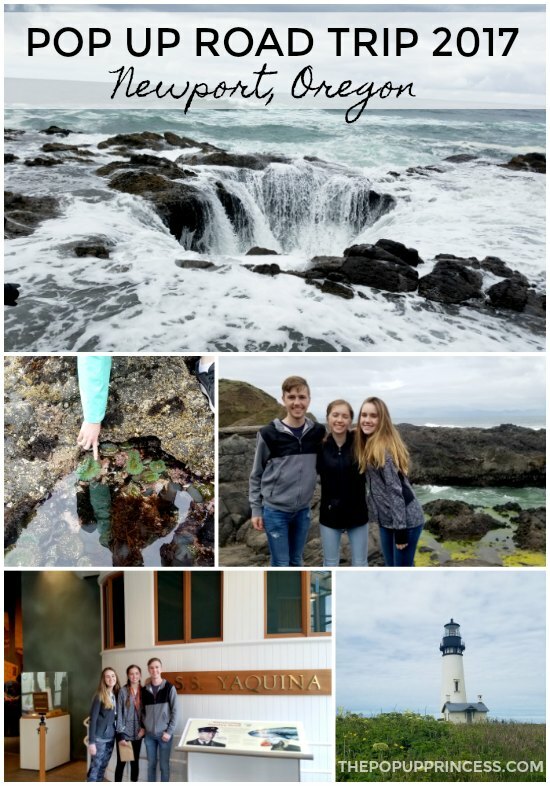 We were able to see Thor’s Well, Cook’s Chasm, Spouting Horn, and Devil’s Churn. There are even tidepools you can explore. I would definitely recommend checking the tide schedule before you go, though. It was low tide when we got there, and although it was great for exploring tidepools, it wasn’t so great for observing Thor’s Well and Spouting Horn. 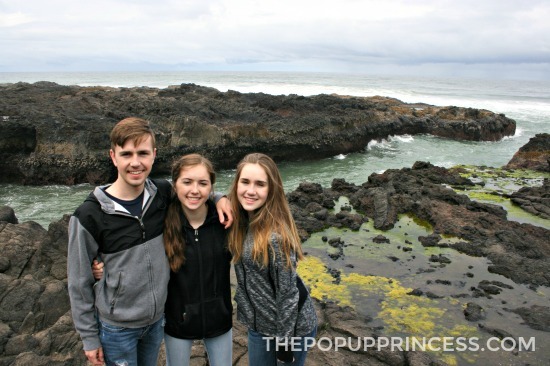 We were able to come back on our way home and observe Thor’s Well during high tide, and it was much cooler. Of course, I was pretty nervous that one of my crew would get swept away into the ocean, so I didn’t let anyone venture too close. And I stayed pretty far back, but it was still pretty awesome from the overlook. The take-away? If you love lighthouses and/or history, this may be your thing, but if you’ve got littles, skip it. Ditto for the Keeper’s House Tour. My kids are older, and have pretty good attention spans, and they were bored silly. I would recommend taking the trail up to the overlook instead. You can get a great view of the lighthouse’s Fresnel lens in action, and it is quite cool. 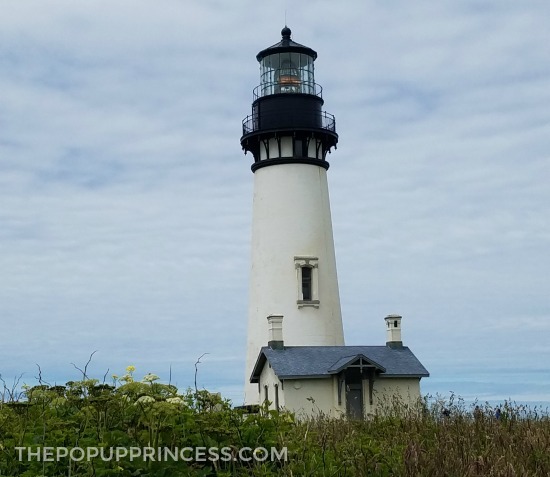 On our second day, we hit the Yaquina Head Lighthouse, which is only about 10 minutes from downtown Newport. 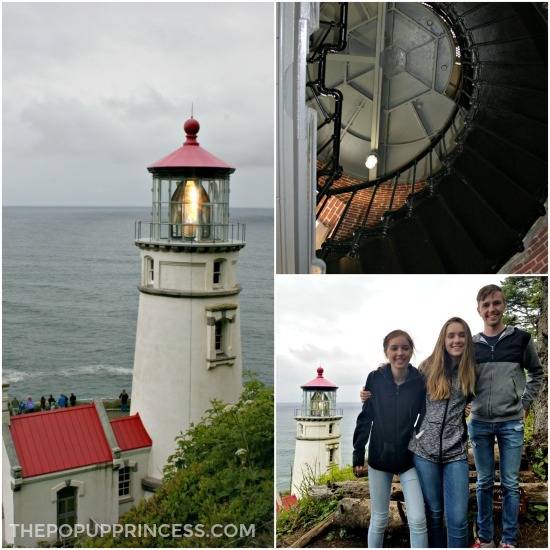 After our previous experience with Heceta Head, my youngest was very skeptical about visiting another lighthouse, but this was a completely different experience. There is a $7 fee to get in, although if you’ve got a national parks annual pass, you get free admission–but this area was well worth the price of admission. 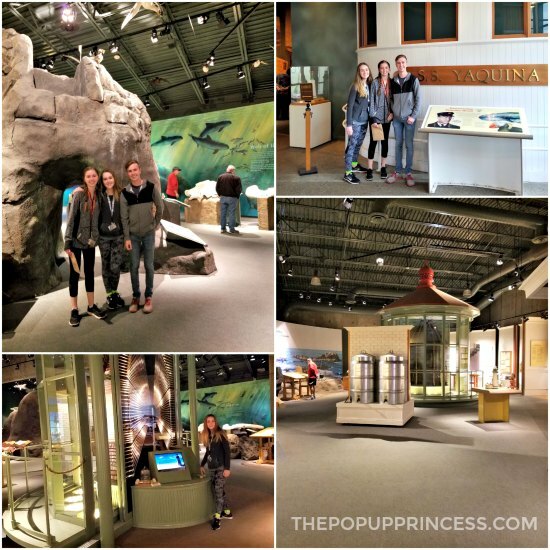 Yaquina Head Lighthouse has a really great visitor’s center. It was full of educational exhibits demonstrating the workings of the Fresnel lens, the history of the lighthouse, and the oceanic life in the area. We spent a good amount of time in the visitor’s center alone. Unfortunately, the lighthouse tours were not available when we went, as they were pretty short staffed. It didn’t matter to us, and my girls were actually relieved (ha! ha!). We found plenty of other things to do in the park. If the lighthouse tour is something you are interested in, though, definitely call ahead to find out their tour schedule before you visit. From the visitor’s center, we took the short, scenic walk down to the tidepool area. 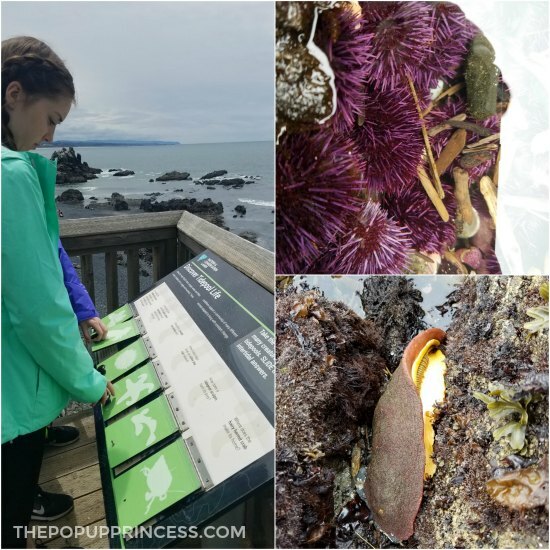 We easily spent two hours exploring the tidepools and the surrounding area. I loved that there were rangers wandering the area, so the kids could ask questions when they were curious. The rangers helped point out different life forms and steered them towards areas that were safe to explore on their own. We could roll up our sleeves and touch nearly all the sealife, with the exception of the sea stars. They were recovering from a disease, so we were only able to observe them visually. 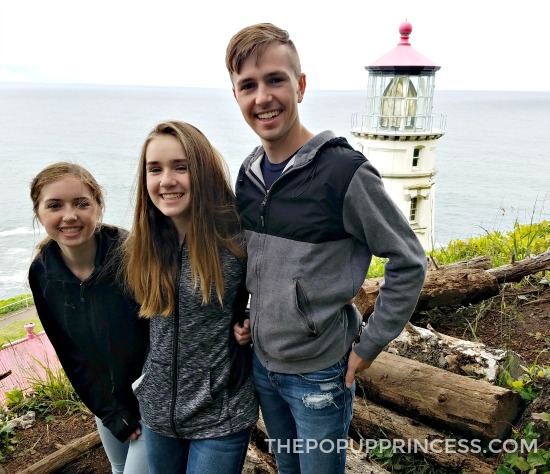 After exploring the tidepools, we wandered up to the lighthouse, and from the viewing area, we were even able to catch a glimpse of some gray whales. They were easy to see by naked eye, but binoculars definitely would have helped us see them better. It was pretty enchanting to watch, and from what I understand, it doesn’t happen every day. We felt pretty lucky to be able to observe them. We also hit Nye Beach while we were in Newport. They had some yummy places to eat–I’m a sucker for clam chowder–and some really cute places to shop. The kids liked the ice cream parlor that had every flavor of salt water taffy you could imagine. And the beach was just steps away. It was a great place to spend the afternoon. Because we felt like we missed out a little on the camping experience, we decided to check out a few of the campgrounds in the area. 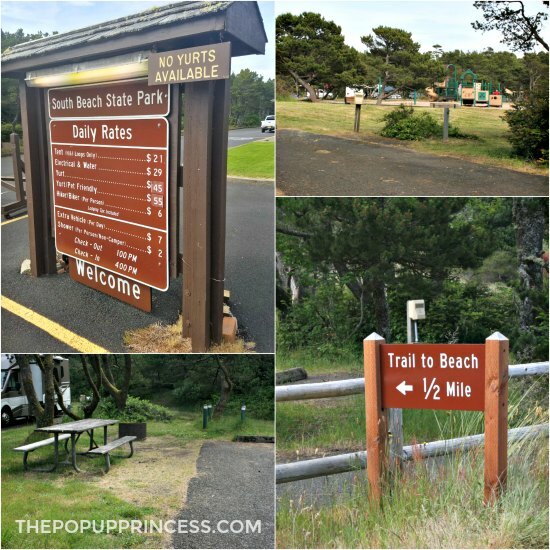 Our first stop was South Beach State Park in south Newport… if you’ve been following us for awhile, you’ll already know how much I love Oregon State Parks. 😉 We had heard great things about this particular campground from a few of our readers, and we were really impressed with what we saw. South Beach State Park has 227 electrical sites with water and 60 tent sites. They’ve also got hiker/biker sites, group campsites, and yurts available. The electrical sites will set you back $29/night, and the tent sites run $21/night. We found that the sites were decent sized, and although not completely secluded, they did offer some trees and bushes for privacy between sites. There is a dump station in the campground, but there are also gray water drains scattered between campsites, so it makes taking care of your dishwater easy and convenient. 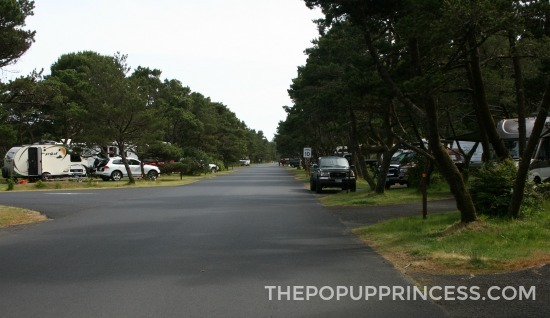 The beach was only about a half mile away from most sites, and there were walking trails throughout the campground. 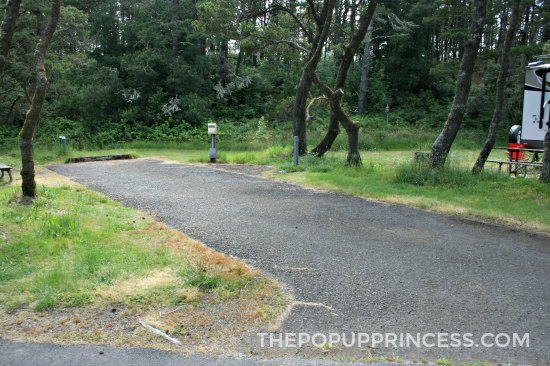 This campground was a kid’s paradise. 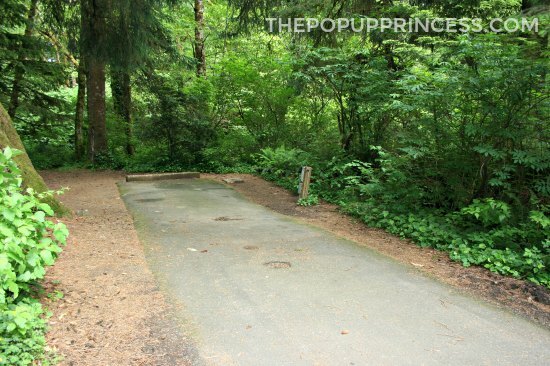 While driving around, we saw a playground area, horse-shoe pits, and a 9-hole disc golf course. There were lots of kids playing everywhere. We also saw several bathhouses, and of course, showers are always included in the campsite fee at Oregon State Parks. Gotta love that! One of the rangers told us that there were kayak tours available, an equestrian area, plenty of hiking trails, and bike rentals at the hospitality center. We took notes, as this is definitely a campground we’d like to bring the pop up camper back to visit. After we left South Beach, we headed north to another gorgeous campground, Beverly Beach State Park. Beverly Beach has 53 full hook up sites (27 with cable TV), 76 sites with electric and water, and 128 tent sites with water nearby. They’ve also got 21 yurts, a couple of group campsites, and a hiker/biker camp. The full hookup sites will run you $31/night. Electric/water sites run $29/night, and the tent sites are $21/night. Beverly Beach also has easy access to the beach. There is a trail with an underpass below the highway, so you can easily walk down to the water. We were in awe of this campground. It had a totally different feel from South Beach. The sites were more wooded, and it definitely felt like there was more privacy between them. In some of the back loops, you felt like you were in a secluded forest, so if that is the type of camping you like, Beverly Beach is the way to go. And while it has the appearance of being pretty secluded, the campground still has flushing toilets, free showers for campers, and the town of Newport is just a short drive away. It really was pretty idyllic. This was Mr. TypeTwoFun’s favorite of the two campgrounds we visited. 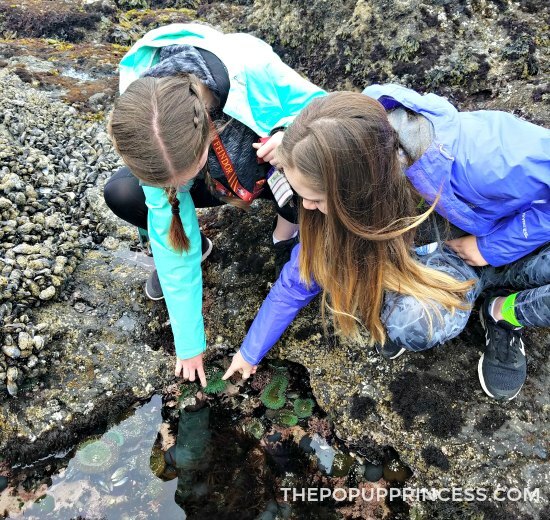 Newport, Oregon has amazing ocean scenery and several fantastic tidepool areas. They are great places for kids to get hands on experience with some of the creatures that make the ocean their home. In order to maximize your time, be sure to check the tide schedules before you plan your day. 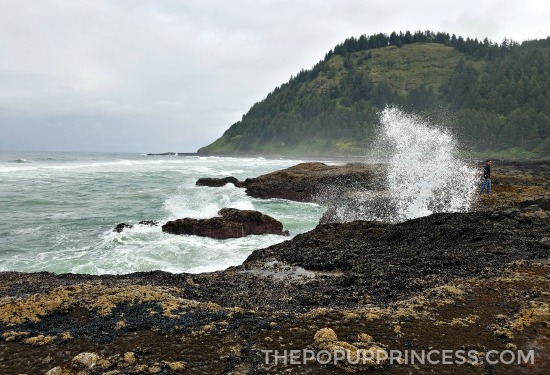 Low tide is great for tidepools, but places like Thor’s Well and Spouting Horn are best viewed during high tide. If you are a lighthouse fanatic, Newport is a great place to visit. The Yaquina Head and Yaquina Bay lighthouses are in town. Heceta Head Lighthouse is about an hour to the south. If you venture about two hours south, you’ll hit Umpqua Lighthouse, and the Cape Meares Lighthouse is about two hours to the north. We thought that little stretch of road would be a lighthouse lover’s dream, but I recommend checking tour schedules before you plan your trip, as they can be intermittent. 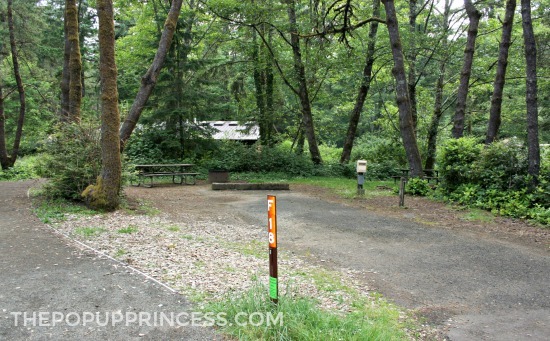 South Beach State Park is a great family friendly campground located in south Newport. It is the perfect spot to bring that pop up camper. Water/electric sites are $29/night and available for online reservation. When we were there it was pretty empty, but the rangers told us that it does fill up in the summer, so make your plans early. Beverly Beach is another great campground just a few minutes north of Newport. This campground is more wooded than South Beach. The sites feel secluded, and there is a bit more privacy. Although they do not have as many activities on-site as South Beach, there is still convenient access to the beach. Beverly Beach does have a few full hookup sites at $31/night, which is nice. Electric/water onl sites are $29/night, and tent sites are $21/night. This campground is also very popular, so if you are planning a visit, make sure to go online and make your reservations early. Downtown Newport and Nye Beach are great for an afternoon out. 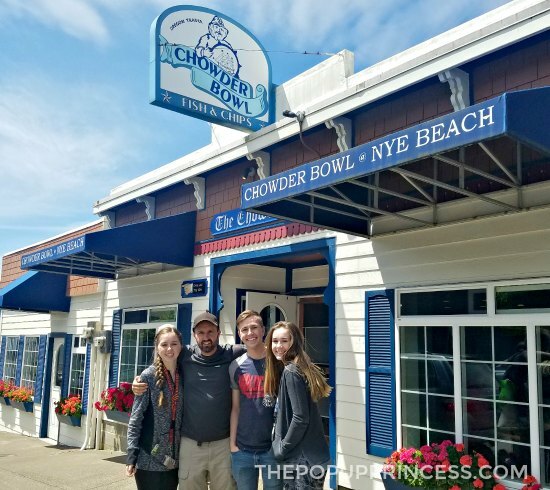 We found some great places to eat (we loved The Chowder Bowl) and shop while we were there. The Nye Beach area also has convenient parking, so you can park the car, grab some lunch, and head down to the beach. It made for a memorable afternoon! Ever visited the Newport area? I’d love to hear what your “must-see” things are. Feel free to comment below! The comments about your kids made me laugh. I have teens too so I can totally relate. 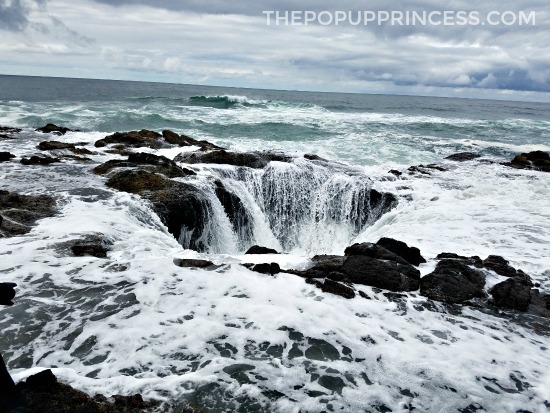 I’ve never heard of Thor’s Well but it’s on my list now! 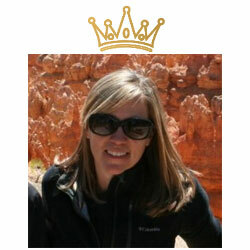 Newport is fabulous, Caroline! You should definitely put it on your list. I may be prejudiced, but I think all of Oregon is beautiful and I love reading your recent adventures to our state. Next time you make a trip to the coast, drive about an hour south of Newport on Highway 101 and check out the Sea Lion Caves. Your trip sounds great! I’ve been checking your site often to “hear” about your epic trip. Can’t wait to hear more about Canada. 🙂 We just got back from pulling our pop up to Gulf State Park in Alabama for our Labor Day weekend trip. We had a great time, too. Thanks for inspiring us to get the camper. After taking it out four times, it was such a fun summer!